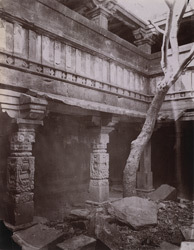 Photograph of an ancient building near the Shiva temple at Menal in Rajasthan, taken by Joseph David Beglar in the 1870s. At Menal there are many Hindu temples built in a picturesque setting on the edge of a gorge with a waterfall, the oldest dating from the 9th century, Pratihara period and the others patronised by the Chahamana dynasty. This view shows the monastery of the Pashupata sect attached to the Mahanaleshvara temple, the best preserved temple at the site, dated from the end of the 11th century. The view shows the colonnade with carved square pillars with pot and foliage motif.